Our night drop envelopes include mechanic's lien information and labor authorization to insure legal approval and a complete understanding between you and your customer. Early bird envelopes gather information that includes all the important information about your customer and their needs. This includes such things as gathering information on what your customer needs an estimate on, whether the customer wants their old parts returned, labor rates, diagnostic fees and more. Estampe also carries night drop envelopes for states that require a 2 part form which allows customers to keep a copy after filing out the night drop envelope. If you wish to order custom night drop envelopes, please call us at 1-866-348-6414 for a custom quote. This Automotive Night Drop Envelope is for states that require a 2-part form which allows the customer to keep a copy after filling out the envelope. This Custom Night Drop Envelope is a great way to personalize your night drop envelope to meet your specific needs. The pricing show on this webpage is for 1-color on 1-side; for more pricing on 2 or 4 color printing please call us at 866-348-6414. We can help you design a completely new night drop envelope or match your existing envelope. This Economy Custom Night Drop Envelope is a great way to personalize your night drop envelope to meet your specific needs. The pricing show on this webpage is for 1-color on 1-side; for more pricing on 2 or 4 color printing please call us at 866-348-6414. We can help you design a completely new night drop envelope or match your existing envelope. 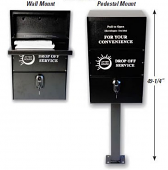 Absolutely the best automotive service night drop box system available. This convenient Night Drop Envelope sometimes referred to simply as a Drop Envelope is a real money maker for auto dealers and repair shops.